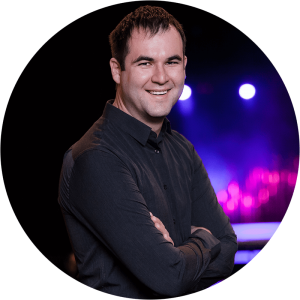 Steve has spent over 10 years within the audio visual industry, with experience in audio, vision, lighting and rigging, and the permanent installation industry. Insight AV serves both private and corporate markets. We specialise in sound, lighting, vision and rigging for conferences, dinner functions, trade shows, small to large meetings, product launches, weddings, balls and any other events where audio visual and/or lighting is required. Insight AV provides a personalised service to all clients and it is important to us to present clients with a wow factor, not only in the events we work on, but also in the service we give. Please get in touch and let us know how we can assist you in any audio visual needs that you have. We were extremely pleased with the exceptional services provided by Insight Audio Visual for the Christchurch 2018 Fitness Expo at Horncastle Arena. Steve from Insight Audio Visual provided value-add services to the expo by utilizing his years of experience and contacts to drive down costs, provide the best audio and lighting solutions that were fit for purpose and also supporting the entire event with his expertise and commitment. Steve’s staff were very friendly, effective and efficient and a delight to liaise with. We were so happy with his services that Gold Lion Events Limited will become a lifetime customer of Insight Audio Visual.